Caribbean vibes, an assortment of tantalising cocktails and delicious food covered in Jamaican jerk spice – what more could you want on a Wednesday night? 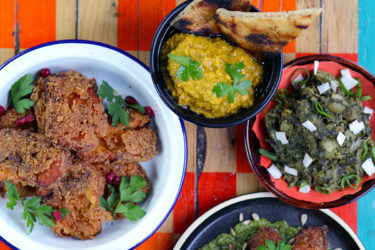 I was invited by the kind team at Turtle Bay to try their brand new menu, the first big update since the restaurant opened at Exeter’s Queen St. Dining. The menu now includes a better range of vegetarian and vegan dishes which I was thrilled to hear. 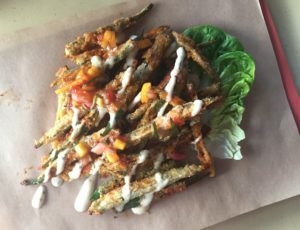 I absolutely love Turtle Bay but I’m not a big meat eater and before, I found that their vegetarian options were quite poor. 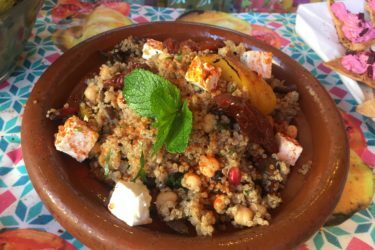 I was keen to re-visit and see what the restaurant could now offer Vegetarians and Vegans. As I’ve said before, I absolutely love the atmosphere in Turtle Bay and tonight, it was no different. The Caribbean music was in full swing and the evening sun was beaming through the floor to ceiling windows. We got seated at a nice spot close to the window and close to the bar – a win-win! Perusing the menu, I did indeed find a great improvement on the vegetarian and vegan front which I’ve been told is a result of feedback from customers. 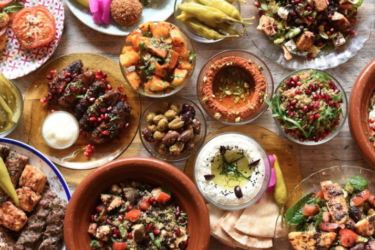 The menu now features a Mushroom and Goats Cheese Burger, Spiced Chickpea Ital Wrap, Vital Veggie Beach Platter, Spinach and Aubergine Sweet Potato Curry, Okra Ladies’ Fingers and a Beach Salad range. To start, I went for the Okra Ladies’ Fingers as they were 100% Vegetarian friendly and I’ve never tried Okra before! They were presented nicely and the dish looked so colourful! They almost looked like healthy fries and tasted just as good, if not better. I would actually choose these over a plate of chips. The Okra fingers were coated in spiced panko and covered with mango mole, fresh lime and coriander mayo. This is the best starter I’ve tasted in a long time. The flavours were so delicious and the mango mole added a gorgeous, fruity taste to the whole dish. Perfect for if you have a sweet tooth. For the main course, I went for the Spinach, Rainbow Beets and Watermelon salad topped with Fresh Mango and Goat’s Cheese. 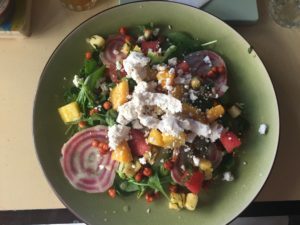 The salad featured spinach, watermelon, mixed greens, rocket, spiced pineapple chunks, beetroot shavings, crispy gem and crispy chickpeas with a citrus lime dressing. So this is what I love about vegetarian food. Everything has so much more flavour. Due to the absence of meat, I find that chefs use a variety of ingredients to make up the substance of the dish which is proven in this salad. The ingredients in this dish made for a delicious, light meal. Everything was so fresh and the sweet flavours from the watermelon and mango paired with the goat’s cheese made for a really nice meal. This salad is the perfect choice if you want something light, particularly on a summer’s day. For dessert, I went with my all-time Turtle Bay favourite – Rum and Raisin Bread Pudding. I will never get bored of this. It’s the perfect comfort food and it’s the cinnamon that makes it for me. It came to the table piping hot which is perfect as I could take my time savouring every last mouthful! As always, I went for the Caribbean Pimms to accompany my meal. It’s the perfect cocktail to accompany this summer sunshine that we are finally seeing! In addition to the favourites, Turtle Bay has added 7 new cocktails to the menu including a Rum Negroni and Rum Margarita. Remember that Turtle Bay Happy Hour lasts everyday from 11:30am to 7pm and then starts again at 10pm so there’s no excuse not to go in and try these new cocktails! 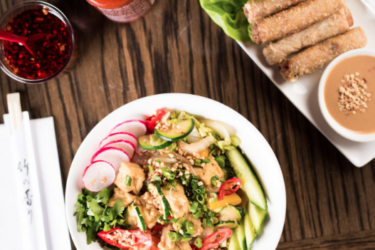 With other new non-vegetarian dishes including a Jammin’ Lamb Burger, Two Way Chicken Burger, Jerk ‘n’ Pulled Pork Bun, Bajan Beef Cheeks and Slow Braised Beef Rib, there is truly something for everyone on the new menu. 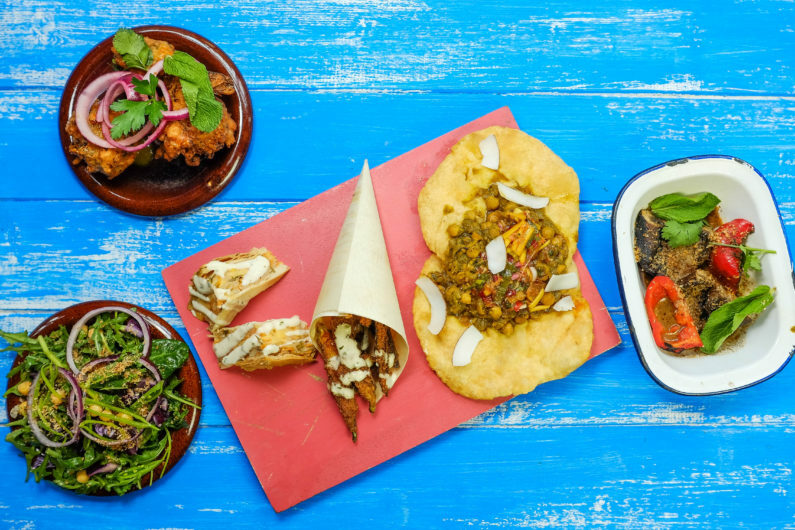 Have you tried Turtle Bay’s new menu yet? Let me know what you had along with your thoughts in the comments below!